You know that you know nothing. 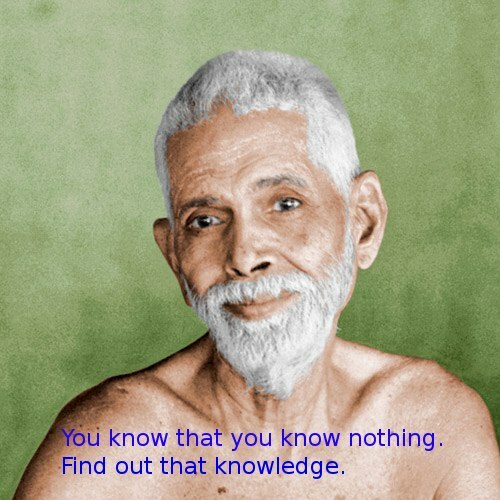 ~ Sri Ramana. “You know that you know nothing. Find out that knowledge. that is liberation (mukti)” ~ Bhagavan speaking in Talk 12 (Talks with Sri Ramana Maharshi). A man had asked the Maharshi to say something to him. When asked what he wanted to know, he said that he knew nothing and wanted to hear something from the Maharshi. Bhagavan gave the response above. (See Talk 12). Bhagavan used to say that the only direct knowledge we have is that “I Exist”. All other knowledge is via inference. Hence the Self-Inquiry, “Who Am I?” was advised by Bhagavan as the primary spiritual practice.